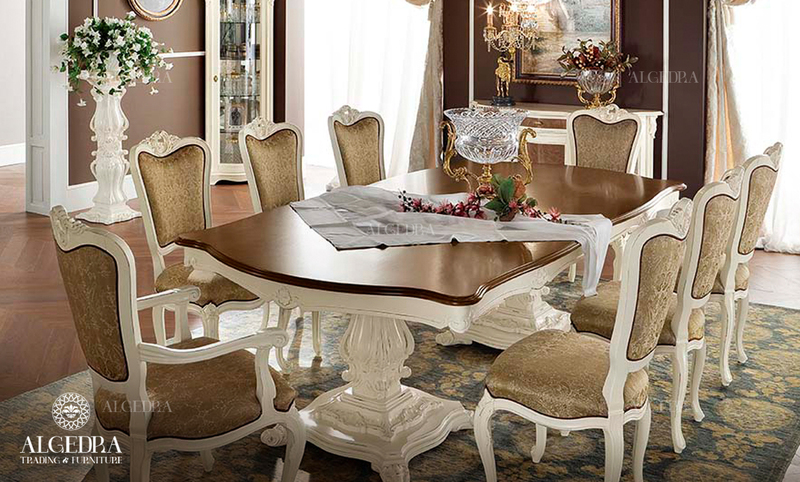 The dining room is the room where the family members and guests gather, so ladies pay special attention to this room to reflect the taste and hospitality of the house owners, the following are ideas to achieve a luxury dining room. 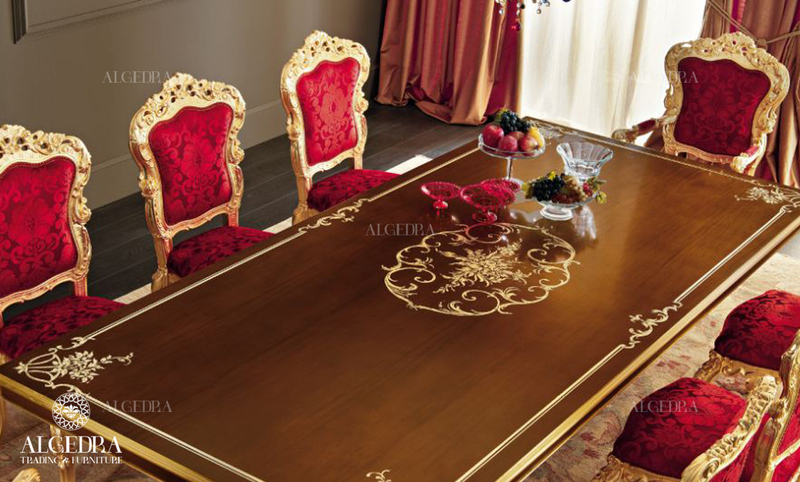 The Gold color always reflects the sophistication and luxury of the designs, and with furniture of a Victorian or oriental Arabic character the golden color makes the dining room look like a royal dining room. To get a luxurious room use the classic style with the blue color for the furniture and saucers closet, and add an elegant classic chandelier and luxury decorations to make the whole room appear very luxurious and elegant. You can also use the off White and its gradient with the addition of a small golden touch, wallpaper embossed soft patterns to give some joy to the room, as well as adding natural flowers in the room to make it more elegant and delightful. Use dark red for the walls and classical wood furniture with a round cupboard table filled with stunning detail and glassware and ceramics, all this will make the dining room more prestigious and exciting, as well as adding a rich carpet and a beautiful chandelier, will Absolutely add a luxurious touch to the room. 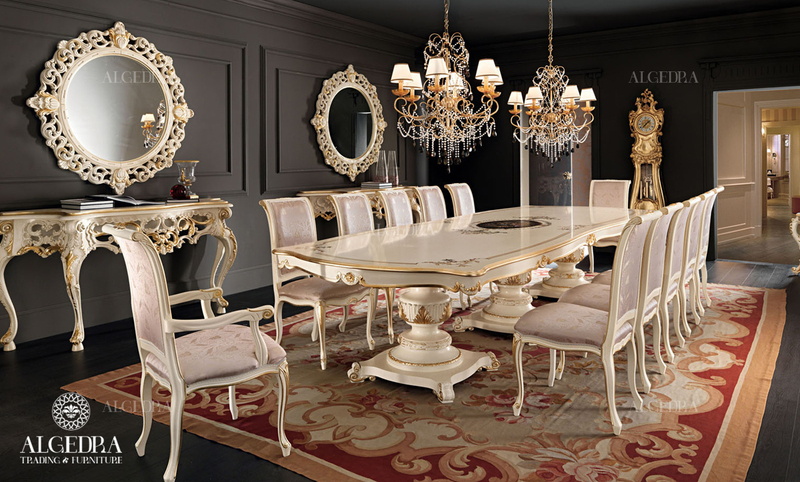 Because luxury is embodied in the details, the furniture must be elaborately made, the chairs and table made of luxury hardwood, raw fabrics and also carpets, curtains light bulbs, chandelier or other lamps, cabinets all of these needs to be addressed, and with all their utensils, too. Colors like gold, silver and cobalt-blue, olive green and red are considered rich and luxurious colors as they help to open the appetite so it is preferred that they are used in the dining room’s paint.